To master the science and art of making moonshine, it’s important you have a good quality still. Finding the still that fits your needs is a lot different than knowing you need one. It can be challenging. You may not know what size you need or what type will match your distilling needs. While it might seem like a lot of work, it doesn’t have to be complicated to begin this very rewarding hobby. We’ve compiled a list of the best moonshine stills of 2018 to help make the process of finding your still easier. What is a Moonshine Still and Why Should I Buy One? What Are the Types of Moonshine Stills? How to Choose a Moonshine Still? A still is a device that uses heat to collect the alcohol made through the fermentation of a moonshine mash. A mash is a combination of water, grains, or sugar, and yeast. The still separates the ethanol, the type of alcohol you’re after, from the mash because it boils at a lower temperature than the water. After boiling, the ethanol becomes vapor and then turns into liquid again and drips into whatever container you’re collecting it in. The still doesn’t make the alcohol, but it separates it from the water and impurities in the mash wash.
A moonshine still is usually made from steel or copper, and they can come in a lot of different sizes. There are three types of moonshine stills, and each has their own benefits. The type that’s best for you will depend on how much room you have, what type of flavor you want, and the amount of purity you desire. One of the most recognizable and traditional stills is the Pot Still, and it’s the simplest design. 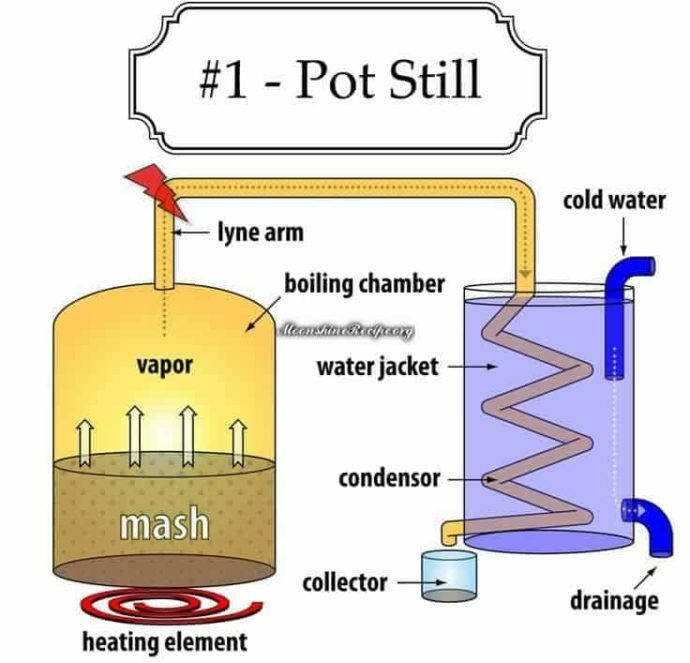 A Pot Still has a large pot, or boiler, to heat the mash water, a tube to transport the vapor, and a condenser to turn it back into a liquid. This type of still captures the natural flavors of the mash, and it’s usually 40% to 60% in purity. The purity can be increased if it’s ran through the still again, but it’ll lose flavor. A Reflux Still has similar parts to a Pot Still — a place to heat the mash, a tube, and a coil — but it works a little differently. A Reflux Still has a long column filled with packing. The packing is usually a metal material, like stainless steel or marbles. When distilling, some of the vapor from the wash will trickle back down through the packing. This column and packing leads to a more purified product, which increases the alcohol content. This stronger drink has little to no taste, and it’ll basically be like you ran it through a Pot Still several times. The third type of still is the Fractionating Still or a Hybrid Still. It’s the same concept as the Reflux Still, but it has a much taller column with packing, around two to four feet. This additional packing condenses 90% of the alcohol vapor and sends it back down the column. It leads to an alcohol with 95% purity with no flavor. This is the purest alcohol you can get from a still without using a vacuum. The still also allows the moonshiner to make very precise cuts between the various stages of distillation — the foreshots, heads, hearts, and tails. Choosing a moonshine still comes down to what features are most important to you. Everyone has different needs and preferences, but we've outlined the largest factors of still ownership below to help you out! Choosing a moonshine still comes down to what features are most important to you. One of the most important things to think about when choosing your still is what was used in its construction. Lead soldering should be avoided because it can lead to lead poisoning. You’ll also want to make sure the metal is rust resistant and thick enough to stand up to years of use. The type of taste you want is another consideration. A Pot Still is also a good choice if you’re looking for moonshine that’ll taste like the mash you use. If you’re looking for a still that will make flavorless alcohol that’s great for mixing, a Reflux or Fractionating Still might be better. A difficult setup with a lot of construction or soldering may not be your style, or maybe you’re into the idea of building your still. You also might want to consider the way you’ll have to clean your setup. A still with a bigger head will be easier to clean because you’ll be able to reach your arm into the pot, but you might have to be more creative in cleaning your still if it has a small opening. Something else you’ll need to consider is the location of your still and its visibility. If you want to make moonshine in a small space, this will affect the type of still you should get. Making moonshine is probably illegal where you live, so it may be beneficial to choose a still you can easily conceal. A still with a smaller capacity that can be used indoors or one that you can disassemble quickly might be better if you’re worried about its visibility. If you’re looking for a traditional copper still and got some space, this 20 gallon still may be for you. Like all of the stills on this list, it can be used for alcohol, essential oils, and water purification. The still is made of 22 gauge copper so it should hold up to the test of time. The still comes already soldered, and you’ll only need to screw the pieces together to assemble it. 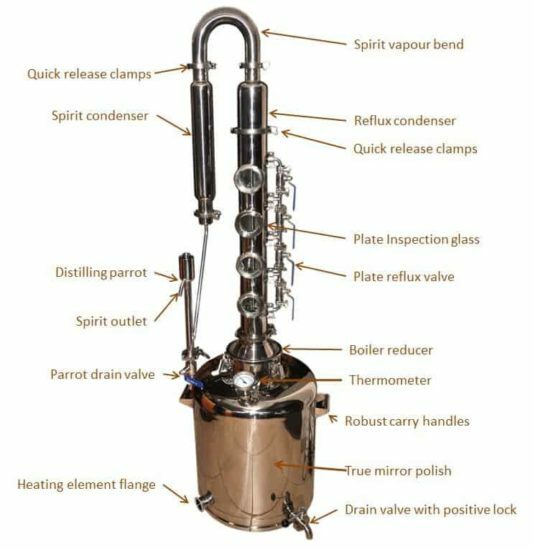 However, it has everything you need for the still itself, and it’s most likely one of the easier still kits to construct. While the copper color looks nice, it does come out of the box with a greenish hue from the manufacture testing it. It’ll probably need a good scrub down to make it shine. If you want an easy way to drain water from the pot, you’ll need to add a drainage hole. The included thumper keg is a nice touch. This keg will give you a cleaner tasting drink, and it’ll make it easier to add flavors to the alcohol. This high-quality craftmanship isn’t cheap though as it’s the most expensive on our list. If you like the look of the Distillery Network 6 Gallon Moonshine Still but want a budget friendly alternative, this still might be for you. Its appearance is similar to the previous still, but it’s slightly smaller. However, the small size doesn’t affect its quality. Its copper is durable because of its 24 gauge thickness, and it comes with a thumper keg. You can clean this still very easily, as the head is large enough for you to put your arm inside the still. If you’re worried about cleanliness, the size of the head is important to think about. One downside of the still is that you’ll still need to buy compression fittings before you’re good to go. There also aren’t very clear assembly instructions, and the package doesn’t include any moonshine recipes. If you’re looking for a still that you can easily use indoors that won’t break the bank, Vevor’s Still might be one to consider. It’s small at only 14 inches, and it’s tank can even be used for fermentation. You’ll be able to cook your mash, fermenting, and distill without additional equipment. The kit also comes with a thermometer for you to easily check and maintain the temperature of your mash. The wide opening and spout at the bottom also makes for easy water removal and cleaning. The build leads something to be desired as the bottom of the condenser isn’t welded. If you’re worried about leaks, you may need to solder it in a few places. The first few runs may have a metallic taste if the setup isn’t clean properly before use. If you’re looking for purity at a value, this Reflux Still may be what you want. It has decent output at one to two gallons per run, so you’ll be able to make larger batches. The tall column will make for purer and more potent alcohol, but it’ll be more difficult to conceal. The still doesn’t come assembled, so some tools are required, and the pieces must be soldered. However, it includes all parts needed for construction of the still, and the manufacturer includes numerous step-by-step videos for construction. However, you’ll have to purchase the hoses and an extension pipe before you’re go to go. It would be great for a do-it-yourselfer who’s looking for a challenge. The amount of construction involved may make the end result more rewarding because you’ll know you constructed the still yourself. If you’re after that Appalachian Still look, this copper still may be what you’re looking for. It’s hammered appearance looks great, but there’s a chance it’ll need a good cleaning before use as it has a green discharge reported from buyers during first use. It has a built-in thermostat, which will make checking the temperature of your mash easier. It’s small enough to be used on the stove-top or another small heating element. The quality could be better though, as some have reported the soldering can be spotty in some areas causing a leak. If you’re attempting to make large quantities of alcohol, you may need to check the condenser and bucket often as they are too small for the size of the pot. It may be better to switch the condenser and bucket for larger ones. This still is the smallest on our list, so it’s great for using on the stovetop or other limited spaces. Everything is included, and its setup is simple. Clean it, connect the tubes, add your mash, and you’re good to go. If you’re a budget conscious moonshiner, this may be what you’re looking for because it’s the most cost effective on our list. The time to break down the setup is also the shortest on our list, and, if you want to keep it out of storage, it’ll look great on display. However, it has a sloppy cooling system, which may not cool the vapor effectively. Also, the quality of the material could be better. The stainless steel isn’t rust resistant, and the soldering on the condenser may not be thick enough which will increase the possibility of leaks. If you want a still that’ll make flavorless liquor with a kick, this Fractionating Still may be what you’re looking for. The stainless steel is high quality and rust resistant, which means you won’t have to worry about that nasty metallic taste in your alcohol. Setup is as quick and simple as a smaller still, and it has a handy spout that can be used to remove excess water from the pot. However, it’s extremely tall, so you could run into problems if you want to keep it out of sight. This height may pay off though, as the tall column gives the still the ability to produce 190 proof liquor in one run. This quality comes at a steep price, but we think it’s worth it. While all the stills on our list are great, our choice for the best still of 2018 is the Spirits’ T-500 Boiler and Condenser System Fractionating Still. It’s pricey, but this is our favorite because of its convenient setup and build quality. It’s stainless steel pot and column won’t rust or leak like the Seeutek’s 2 Gallon Copper Tube Moonshine Still, but its setup is just as simple. Its output is quick, and the alcohol it produces is pure, which will help you decrease your time spent producing. It also looks just as good as the traditional looking copper stills like the Alchemade 5 Gallon Copper Alembic Still. It’s great if you’re wanting to produce alcohol that can be mixed, and it’s extremely simple to separate the various stages of alcohol production. We believe this Fractionating Still would be great for a beginning moonshiner or a seasoned producer. Check out one of our Facebook member's review of the T-500 here!